After “eating for two” during my pregnancy and gaining 5 stone in weight before my due date, I knew that I really needed to do something about it once my daughter arrived, but being overweight had really affected my confidence. 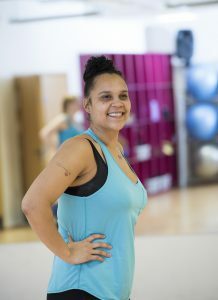 Taking part, for the first time, in one of Tina’s classes, was the best move I’ve ever made, as she made me feel really welcome right from the start and she was so supportive of me as a beginner too. 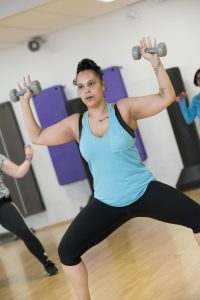 By offering the option of low intensity moves and making me feel comfortable about my own ability, she allowed me to feel completely ready before I stepped up to the high intensity moves that the majority of the class were doing. This was much better than me hurting myself early on by trying to do too much and pulling a muscle. great as I didn’t want to go to classes and give just 50%, I wanted to see results and I knew that meant giving more. Because I didn’t feel confident about myself, I used to hide at the back of the class, so that no one could see when I went wrong and didn’t do the routine properly. I was also worried about my weight, but now, when I look back, I don’t know why I was so worried as there are people of all shapes and sizes in the classes and not everyone is slim and fit. I stayed at the back of the class for about a year, even though by then I knew all the moves and gradually as my confidence grew I started to creep towards the front. The more I got stronger and made friends with some of the amazing ladies in the classes, the more I felt my confidence return. I now love being at the front of the class, picking up on Tina’s energy and I’m much more happy now I’ve gained back most of my confidence.